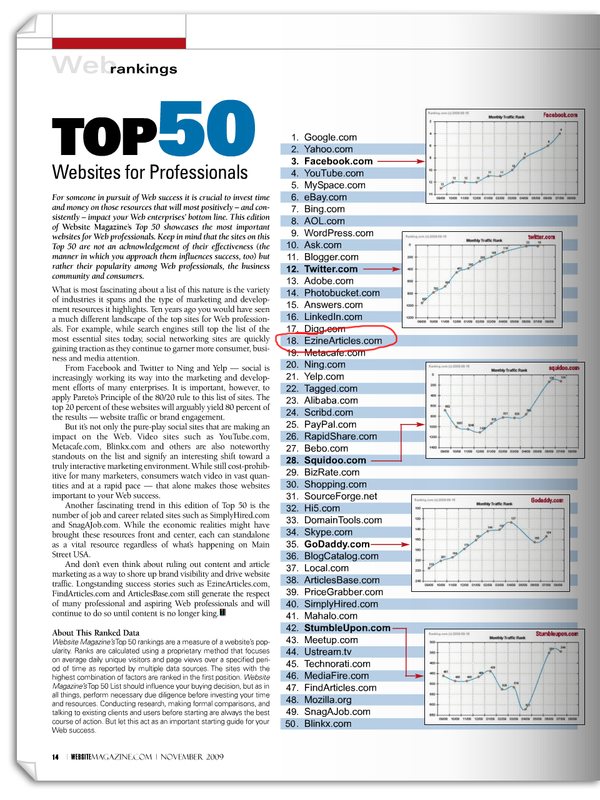 Website Magazine has ranked EzineArticles.com #18 on their list of the “Top 50 Websites for Professionals,” in their November, 2009 issue. Websites that make the cut, like EzineArticles, Google, Yahoo, Facebook and YouTube, are considered the most important for Web professionals based on their popularity among Web professionals, the business community and consumers. Congrats!!! Hope you would be in top ten in the ensuing years. ALL THE BEST!!! Well done Chris and EzineArticles! 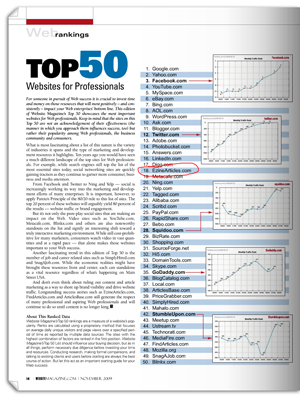 Congratulations to the EzineArticles team for being recognized as one of the main authority website for the professionals. Congrats. I always find EzineArticles articles very informative and useful. More power to you, guyz . Big cheers! I think you deserve more than #18 because I have seen your articles to be very informative. More kerosene in your lantern. Got the magazine the other night and was thumbing through it after dinner. Looky-looky one of my TOP professional websites finally getting the kudos they deserve. Congrats to Chris and the hard working EzineArticles staff. Congratulations to EzineArticles Team. Without a doubt, it is one of the world’s best websites! EzineArticles – The King of the Web! Congrats and Best wishes for future successes!!! Excellent, congratulations, this just confirms our faith in your site and the quality of articles available. Congratulations EzineArticles.com! Long live EzineArticles.com! (We do not accept articles that do not use paragraphs to appropriately break up the body of the article. Please ensure that your article contains these appropriate breaks). and everything seems ok. Could you show me an example of whats good and whats bad. If you have time of course. My article is the benefits of the Goji Berry. For examples of this, go to any EzineArticles article that is currently online and you will see the blank line breaks between the text blocks. Thanks a million Marc. Now I finely see it clearly.